Its been an extremely hot and muggy week here in VA. But we are happy to be home. There is no place like home. On Thursday Emily continued onto Round 7 of the Avastin/Irinotecan/Temodor. It was day 1 and she received the Avastin by IV. On day 4, which will be Sunday she will start the two oral Chemos at home. The last round they upped her dose on the one of the orals because of her weight increase. Counts were checked and platelets dropped from 34 over the weekend to 27. Dr Gowda likes Emily to have her platelets at 30 for this trial so she received 3 units of platelets. While also at the clinic, I talked to Dr Gowda about a few things...just a few things that we have been worried about. MDS (pre-leukemia)... We have been worried about this mainly because there have been a few kids with NB who also were diagnosed with a secondary cancer. We know from the stats that it can happen, but they talk that it normally happens later in life. There have been a few of these kids that it has happened maybe in only a few years from NB diagnosis. OMG. So, i asked what he thought Emily's probability of being diagnosed with a secondary cancer were? He said the probability was high. I asked what out of the treatment she had made her probability higher? He said pretty much anything that she has had but that MIBG Radiation Therapy was one of the highest. Of course I remember when she had this treatment we remember them telling us that it could cause a secondary cancer. I asked why? Dr Gowda said it is from the extremely high dose isotope that radiates though their bone marrow. Not really what I wanted to hear, but it's the reality, its just the reality of what our children may have to deal with. Just like he brought up fertility, that many of the drugs she has taken, she will not be able to have children, and that it can also mess up their premenstrual cycles and such. While many of these children not only have to deal with the cancer itself, the immediate side effects of the chemo, but also the long term effect of the chemo. Some of the long term side effects can happen later in life, all that we are aware of. It's just the reality of it! Emily's oral chemotherapys are delivered by mail order through CuraScript. Both of the oral Chemos were supposed to be here today, so I called to find out they had a back order on the temodor. I was very upset that we didn't receive a call to let us know, so they are working on transferring the script from CuraScript to a pharmacy here if they can get all of it that we need. Just got word that it should be ready tomorrow, just waiting to hear the verification from the pharmacy. This past week there have been several children that have passed from NB, it breaks our hearts. It not only breaks our hearts, but it really puts the fear in you, and makes you fear what each day could possibly bring. This week literally has been one of those weeks, we just don't understand why there isn't a cure for these kids. They deserve it. They really do. While we never say it, but we always fear that Emily will not make it to her next birthday. We question ourselves, will she be here next year, will she be here to celebrate? We know that things can change within a day or a month, or 6 months. But it's the reality. While we hope and dream for that miracle of all of her disease one day being gone, I think our fear will always be "worried", "anxiety" of why she has pain somewhere in her body, "fear" and being "scared"! Please think about these kids, and hug your kids extra tight tonight and make sure you tell them how much you love them. Make sure you hug and kiss your kids and tell them how much you love them. Will keep you updated on how Emily is doing with the chemo this week. Navid started this foundation to raise funds for pediatric cancer, specifically for Neuroblastoma, which all started from Hayley Kudro. Along his travels, he has stopped at local children hospitals and visited with children fighting cancer. Also along his journey he has done many interviews, and local tv interviews...Navid would love to have CNN or FOX or Katie Couric or Ellen Degeneres make this huge as well... Come on supporters, you are all following Emily so you are for childhood cancer, lets like his page and if you can make a donation, please do so!!!! Overnight he has made quite a few followers on facebook, help him out. Make his final destination a huge welcome, he is having an event there!!!!! There is one thing that we will always have and that is hope...Hope that one day Emily's body will be rid of cancer, and hope that one day she will be done with treatment and not have to visit the hospital once to twice a week. That hope is something that we hold onto. We hold it tightly and continue to hope that one day all of this will be behind us. 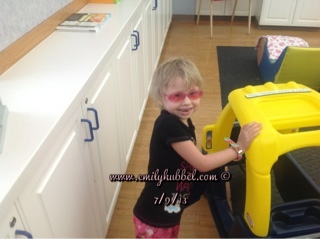 Emily's MIBG scan was done and as always Emily rocked the scan. No problems. From laying so long and still her shoulder was hurting, but she held still and completed it. Emily always rocks the scans and we are so proud of her. After her scan, we quickly went to get some food from the cafe and we ran into a man who asked "Are you Emily's mom?" I said, "I am." We have HOPE magnets on our van that has a picture of Emily in the O of hope and her website... This man went back to his room and looked up Emily's website. This is what I call amazing and this is how you spread awareness about childhood cancer. YEA. Thank you for checking out Emily's page. After grabbing something to eat, we quickly went back to the Renucci Hospitality House to get everything packed up and in the van so we could be out of there by check out, 11AM. We are ready to get out of Michigan and get home. We ran into many families today, other NB families who are also enduring this fight like we are. Christopher Grimes, one we have followed for a long time, we met Chris and his dad. Kristen, his mom, wasn't there, but we are sending many thoughts your way. Brooke was there with her mom and grandma. Many kudos to Grandma for staying with Jessica and Brooke for as long as she has so far away from her own husband. And lots of love to Jessica and Brooke, we always think of you guys!! Emily enjoyed seeing Brooke and playing wth her today. Henley Bravebee Romine was with her dad, but we didn't get to meet her. Dad saw her in the playroom and she was laying on her dad and didn't seem like she was well. They didn't receive great news today. Henley, we are sending comfort and love your way and hope you are not in any pain and we continue to hope for that miracle. We also saw Molly Adair again today and we are so happy, she continues to be NED. Go Molly, you rock girly... There may have been other families there, but we are not sure or we didn't meet them. Dr Sholler came in and said "Everything looks good!" The report actually says: "Impression: Stable CT examination and overall decrease in MIBG avid disease. No new lesion is identified." Some of her spots are actually gone and the rest of the them are decreased. This is amazing news because we have never been this close and some of the spots that have never made any change from the very beginning of diagnosis are almost gone. This time she also didn't have any spots that have an increase in disease... We are so happy to hear this news, very happy. Dad and I hugged in the room, we were so happy to hear this news. So we head home with happiness and know that what treatment regiment we chose for Emily is working and Emily looks great and even feels great. 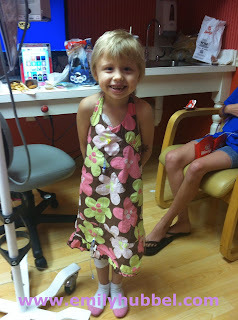 Emily will go back home and do two more rounds of the Avastin/Irinotecan/Temodor trial. We hope to go back to Michigan after these two rounds and show even more decrease and HOPE for even better news the next time. As I said before, "Hope is a Waking Dream". We will continue to HOPE that one day her body will rid of this horrible disease. So we are far from over this fight, but we know that what we are doing is going in the right direction and hopefully that means we are steps closer to where we want her to be. Emily is an amazing fighter, we told her the good news and she is happy too. All of her spots (12 to be exact) are almost gone and she is happy about that. This makes it easier for Emily to know why she is doing what she is doing with treatment, food and homeopathic. We want to continue to thank all of you who follow Emily and our family and send love, thoughts, gas cards and gifts. They mean so much to our family as we continue this fight. Please know we appreciate all that you guys do during this time, Thank you! Right now we are driving heading toward Pittsburgh to stay with Sue and Jo and we will leave early in the morning to head home. We are excited to head home because Emily can't wait to see her BFF, Lilly, for the weekend. Emily will have clinic next week to start Round 7 of the trial. Dr Gowda at VCU has already been notified of the great news from Dr. Sholler, and he is happy to hear the news and ready for Emily to start the next round. Remember to hug and kiss your kids every night and tell them how much you love them. Today Emily had clinic and MIBG Injection. Clinic included getting accessed and checking counts. Getting accessed today was one of those that really made me want to cry. Julie didn't get to access Emily today and I really wish she did, because she never has any problems, but the girl who accessed her today, didn't the needle in straight and couldn't get blood drawn. She messed with it several times while Emily was sitting on my lap, screaming and crying she wanted to go home and saying it hurt and asking her to stop. I said we never have this problem, it must not be in correctly. She stopped and called another nurse in, who looked and felt around and by this time, Emily's anxiety was up and she was over it. She lady ended up having to pull it out and poke her again, and this time she got it. Emily was glad it was over, and I was wishing Julie was there to access her so Emily didn't have to scream and cry over getting her port accessed because she hasn't done that in a good long time. Since siblings can't come in, Dad was out in the waiting room with Brianna and later when I told him about it, he said you need to learn how to access her so that if that happens, you can do it. I do need to learn how to do it, plus it would also help at home if ever needed to for whatever reason. All of Emily's counts look good, except her platelets did drop, they dropped from 43 to 32. She did look like she was getting petechia, but I think the reason it looked like that is because of how much they messed with her port area and with her platelets being low. MIBG injection was no problem except for radiology was running behind because they had an emergency scan study. We always hate to hear that, because we normally know what those mean. We finally got to meet Molly Adair and her mom, and it was really nice to finally meet. We have been talking to one another for the past two years and after two years we finally got to meet. I also got to meet Jason Greer, Tristan's dad. He knew we were here because he saw the HOPE Magnets on our van. (Thank you Sue and Jo for making those for us) I didn't have the pleasure of meeting Tristan, but I did get to meet his dad. It is always nice to meet other families that you follow along with their journey and actually get to put a face with the name. I know there are a few other families here, but we didn't meet them. Tomorrow is scan day, Emily has scans first thing in the morning at 830AM and then we meet with Dr Sholler at 1230PM. Dad and I were talking about it earlier, we are pretty nervous about the day and what the results will bring, but we have HOPE. We don't know what treatment will look like moving forward or anything like that at this point, but we are just taking it one day at a time. So make sure you wear your Team "Emily Gear" and share it with us. You can send it to email at Shannon@emilyhubbel.com or share it on facebook. Remember to always hug and kiss your kids and tell them how much you love them. We will update tomorrow. We made it to Michigan at the Renucci House. Tomorrow Emily has clinic to get accessed and check counts along with HMA/VMA. So far she hasn't been bruising so hopefully she is still good on not needing platelets. She has her MIBG injection afterwards Thursday morning is scans, MIBG/CT scan and then we meet with Dr Sholler afterwards. Make sure you wear your "Emily Gear" and share it on facebook, we would love to see it. Wow, I haven't updated this in a very long time and I apologize. I tend to update facebook just because it is much easier to do so. 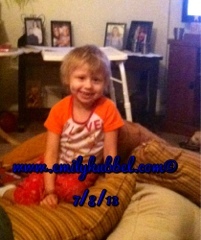 If you want to read Emily's updates or see pictures of her you can go to www.facebook.com/emilysjourney and like the page to follow. Emily completed both round 5 and 6 of the Avastin/irinotecan/temodar trial. She had a horrible bout of pink eye during round 5, which took a lot longer to heal and go away, but it finally did. Round 6 she completely rocked, Dad and I think it had a lot to do with her BFF, Lilly who was by her side almost every day. Thank you to Lilly's Parents for letting Lilly be by Emily's side. Emily also turned 6 on May 30 during Round 5 and Diva's and Dudes has been wanting to give Emily a party since she was diagnosed. We finally were able to have the party there and it was wonderful. Emily really enjoyed herself along with her friends. Thank you Diva's and Dudes. Emily should also be started Extended School Year soon where she will get some time each week to go over things at home, but come September Emily will be a big first grader. While she missed the kindergarden graduation and much of the other kindergarden events, she will be a first grader. Emily's sister, Jessie. graduated 5th grade with honor roll and presidential award. We are very proud of her and her accomplishments, so next year she will be going to Middle School. We are very excited for her, and nervous all at the same time. Brianna is Brianna, silly girl and loves to sing. She will be 4 at the end of September. They grow up so fast. Also, we want to send out some amazing kudos to a young man that we met back in April, by the name of Navid. 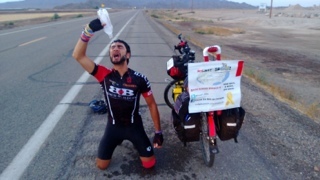 Navid is riding his bike from Harrisonburg, VA to San Diego. He is currently already in Phoenix, Arizona and we are so proud of him. He is riding his bike to raise funds and awareness for Pediatric Cancer, in specific for neuroblastoma. 3000 miles, 8 weeks, One Cause. His foundation is called ProJeKt 3000, and his facebook page is www.facebook.com/ProJekt3k, If you would like to make a donation you can go to www.gofundme.com/projekt3k. Please make sure you are following him, he deserves some likes. Now today....we are in Pittsburgh, PA....its our half way stop to Michigan. We were going to go with the whole family, Jessie was going to go with us this time. She has never been able to go with us, because she is normally in school, but we had forgotten that she had a prep class this week for Middle School, we will miss her. So, its the 4 of us again making the trip. Emily has MIBG Injection and Clinic on Wednesday and scans on Thursday at Helen DeVoes Children Hospital and then we meet with Dr Sholler to go over scans. As always, scanxiety is at an all time high... and we are always hopeful for those 3 wonderful letters, NED. However, we will be happy with stable and/or decreased disease. Being that we finished 6 rounds of the current trial that we are on, and that was what we had set out for Emily to do, we are anxious to know what are Emily's next steps, will she continue on the same trial, will she need to do another trial, or what will she need to do. Anxiety is especially high, being that many of the kids that we read and/or know, are not doing well. And this is really heartbreaking and really scary to us. Things can change so quickly that it will make your body spin and you fall to the ground, this is something that worries us all the time. We also want to send out lots of thanks to so many who are always by our sides, thinking of us, sending us messages, donations and gift cards. We really appreciate all the love and support and to those that are so wonderful. And we are so thankful to our wonderful friends, Sue and Jo for always being there for us. Thank you again to everyone for all that you do, and you all know who you are. We will continue to update this week to let you know how things are going. We should be in Michigan by tomorrow evening. Make sure you always hug and kiss your kids and tell them how much you love them.